If you have a lot of files and folders scattered on your computer, you probably wish Windows Explorer was better at file management. 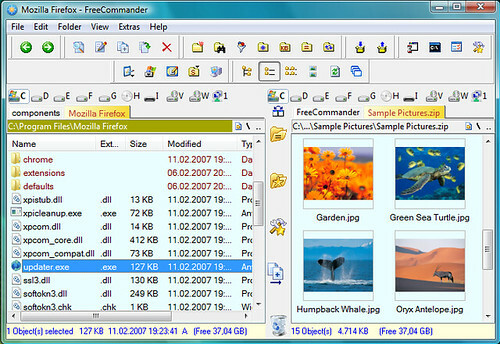 Coming to the rescue is FreeCommander, a freeware file manager that adds many useful features on top of simple folder navigation. You can open folders in tabs just like in your web browser, work with ZIP and RAR files without additional software, filter files for quick searches, and split files among many other features. Probably the most useful feature is the split pane interface so you can view and work with two different folders at the same time. But the best kid in town has always been (and shall always be) Total Commander ( http://www.ghisler.com/picture.htm ). Its very european low profile would never do justice to what this beast and the miriad of plugins are able to do to your system. Formerly known as 'Windows Commander' ,as all the 'commanders', with the nostalgic hommage to the legendary 'Norton Commander'. Total Commander is a classic, but the only downside is that it isn't free.